This video explains how to find the equation of a line when given 2 points. Find the slope using the slope formula, . 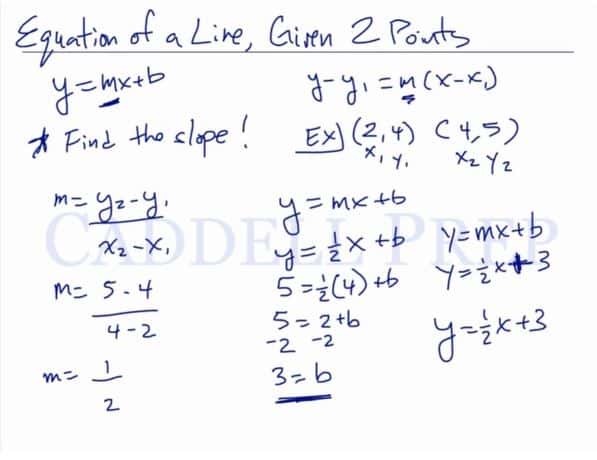 After finding the slope, plug in the value of your points into either slope-intercept form, or point-slope form, to get the equation of the line. Let’s find an equation of a line, given two points. But in both cases we need to know what the slope (m) is. So the first step is to find the slope. First, let’s find the slope. So now, we can find the equation of a line using the slope intercept form or the point slope form. Let’s do the slope intercept form first. Now, you can substitute any of the paired coordinates but not both. Now, we know what the y-intercept is and the slope. Now, let’s solve using the point-slope form. Here, we can choose which pair to use as coordinates. Let’s get by itself by adding on both sides. which is the same as the first one.